I will be offering some Cerebus original art for sale, hosted by Charles Costas at his CAF site. I want to thank those who participated in Gerhard’s “Backgrounds in the Forefront” Cerebus Art Sale. Both Gerhard and I were overwhelmed by the positive response from fans like you. We’re glad that many of you were able to pick up a page for your collection, but also realize that there were others that felt that they missed out and were hoping that they’d get a shot at purchasing some more pages. Well, we listened, and I’m announcing a follow-up sale in which we’ll be offering another 20 pages directly from Gerhard’s personal collection. 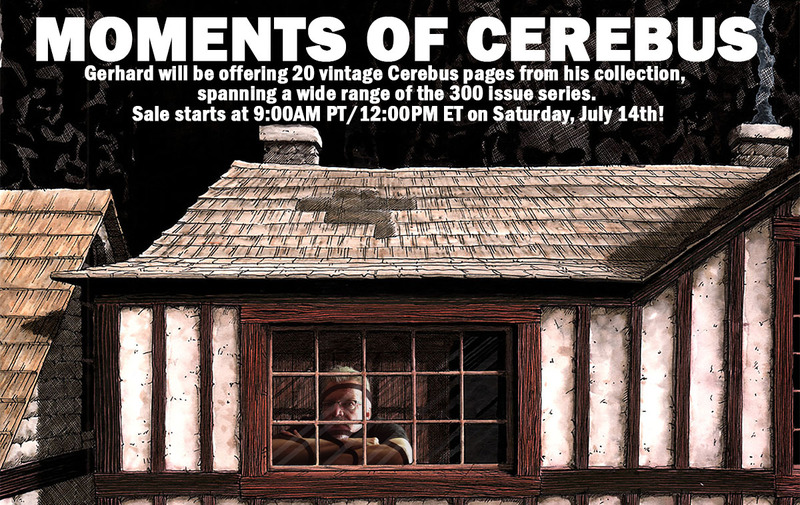 This sale we’ve titled “Moments of Cerebus” as many of the pages will feature Cerebus (or other main characters) on them at different points in Gerhard’s run – from Church and State to the Last Day. The sale will kick-off the day before Gerhard’s appearance at the LA Ultimate Comic Art & Collectibles Show (go to www.UltimateLAShow.com for more information). Pieces will begin to be sold at 9AM PT/12PM ET on Saturday, July 14th. I will run the sale the same way that I have run the previous sales by listing each piece one at a time over the course of an hour through my ComicArtFans gallery (http://www.comicartfans.com/galleryroom.asp?gsub=179126). Orders will be accepted on a first come, first served basis – so when you see a piece you want, e-mail me a comiconxion@hotmail.com. Although we heard the feedback that some people would like to see the pieces we will be offering in advance, I made the decision (not Gerhard so don’t blame him) to keep things the way we’ve been doing them and wait until the day of the sale to reveal the pieces that will be sold. I’m sorry that it may disappoint some of you, but I think that it adds to the excitement of the sale. What I can tell you (which may help you strategize) is that I plan to release all the pages in the order in which they were published – I’ll start with Church & State and will end with the Last Day. So, if there are pages from particular storylines that you’re hoping for, you’ll know when they may be coming up. I’m excited about the pages that we’ll be offering in this coming sale. No, there will not be any covers (that was asked last time), but yes, there are some nice splash pages! And, once again, a wide variety of different Gerhard backgrounds. We realize that this sale falls closely on the heels of the previous sale and there are other things that require financial attention. But, this is definitely the last selection of pages that we’ll be offering this year. Therefore, I’d encourage you to consider taking advantage of our free time payment structure. For more information, feel free to contact me in advance of the sale to discuss. Finally, I wanted to close with a quote from a previous buyer (you know who you are). It brings joy to Gerhard and me to know that pages from his collection are going to true fans and are being enjoyed. I look forward to another fun sale next month and for those who would like to see Gerhard live, please do consider joining us at the LA Ultimate Comic Art & Collectibles Show on July 15th at the LAX Hilton. Gerhard will be bringing some additional art including pages from his work with Grant Morrison on the “Smile of the Absent Cat” from Heavy Metal. And, he’s currently working on a special fine art print with illustrator extraordinaire, Frank Cho that will be released at the show. Ssshh! Don’t tell anyone!